Bring a large pot of water to a boil for the pasta. 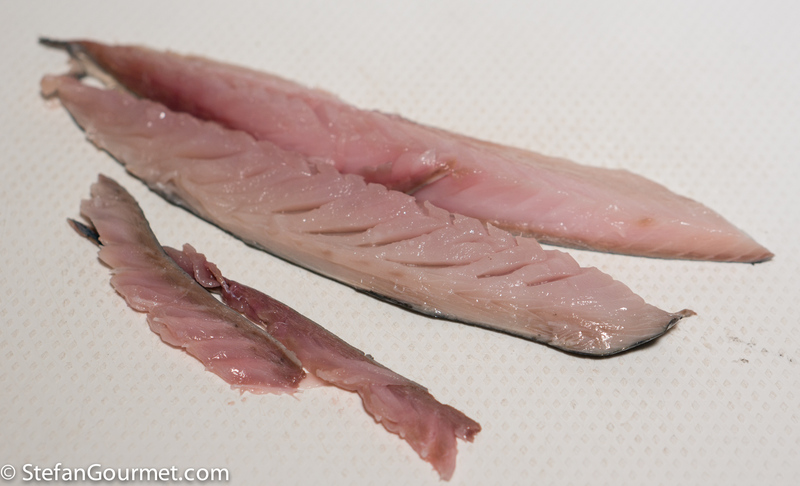 In the meantime, cut away and discard the central part of each mackerel fillet that has bones in it. 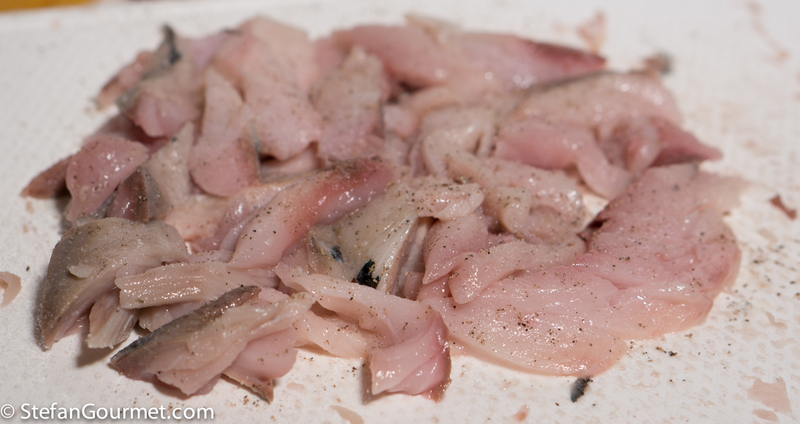 Roughly chop the mackerel, and season with salt and freshly ground black pepper. 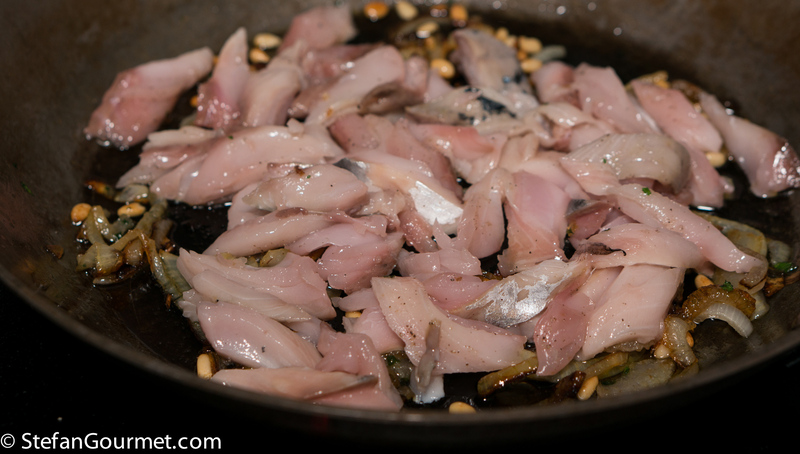 Seasoning the mackerel before cooking it, allows it to absorb some of the salt so it will have more taste. 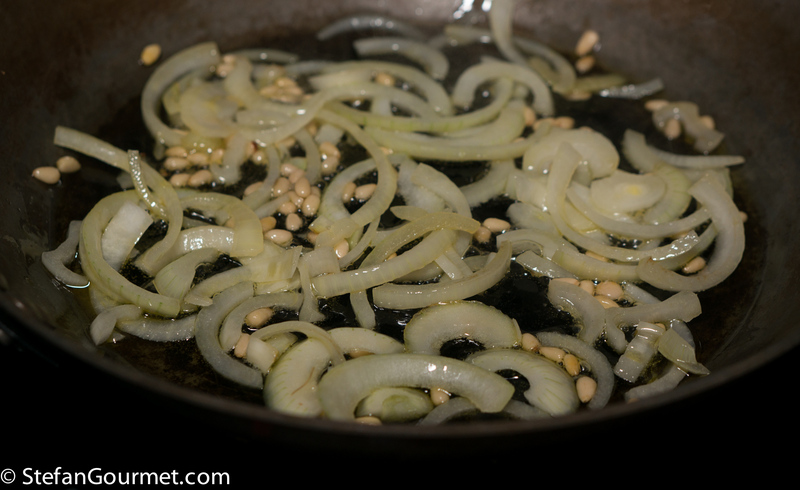 Put the onion in a frying pan with 1 tablespoon of the pine nuts and 2 tablespoons of olive oil over medium heat. 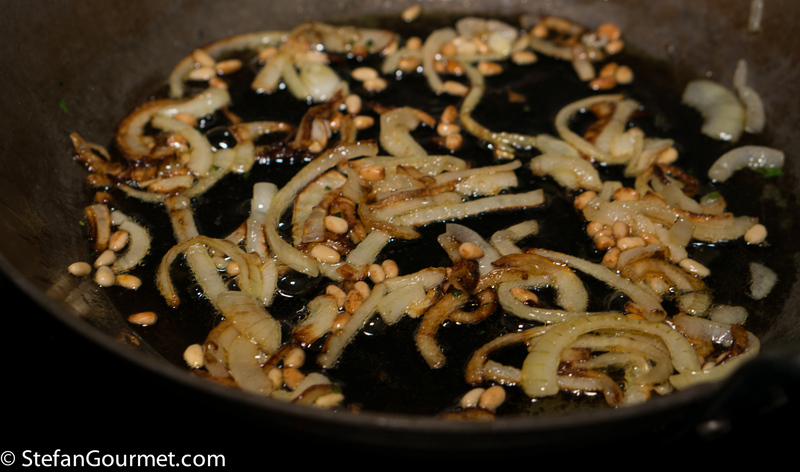 Cook this, stirring regularly, until the onions are soft and the pine nuts are golden. 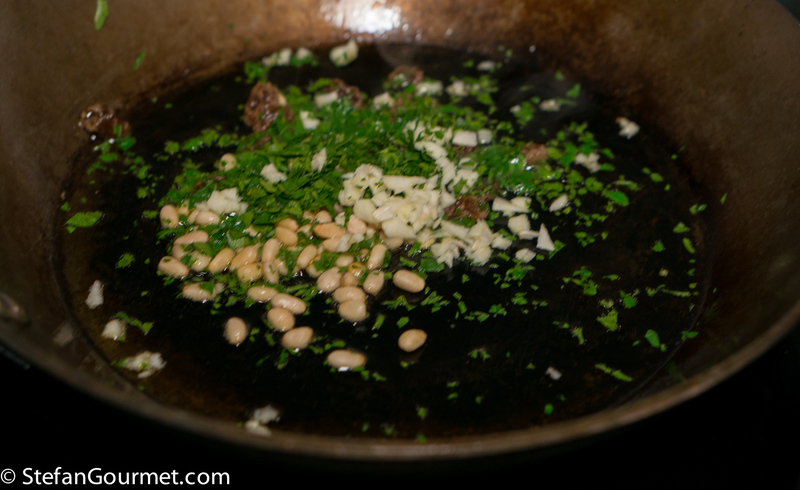 In the meantime in a separate frying pan, add 2 tablespoons of olive oil, the parsley, the other tablespoon of pine nuts, the minced garlic, and the raisins. Cook over medium heat, stirring constantly, until the breadcrumbs are golden. 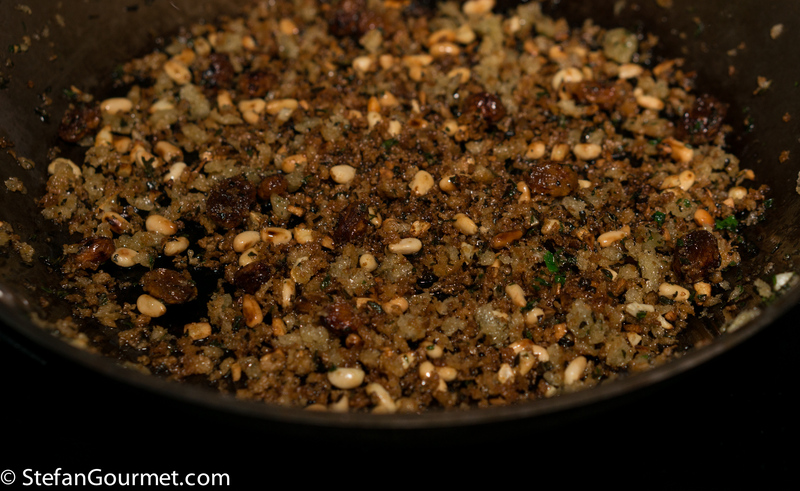 Transfer the breadcrumbs into a bowl and set aside. 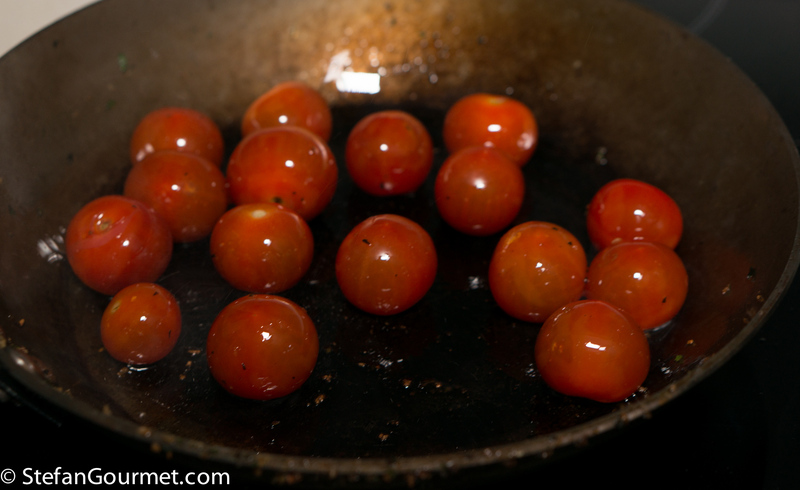 Clean the frying pan with some kitchen paper and add a tablespoon of olive oil and the cherry tomatoes. 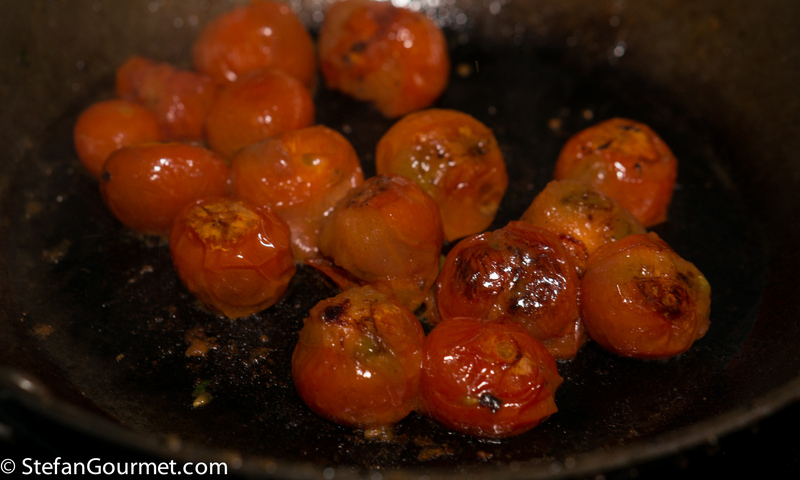 Cook over medium heat, stirring regularly, until the tomatoes are blistered all over and getting soft, but not falling apart. 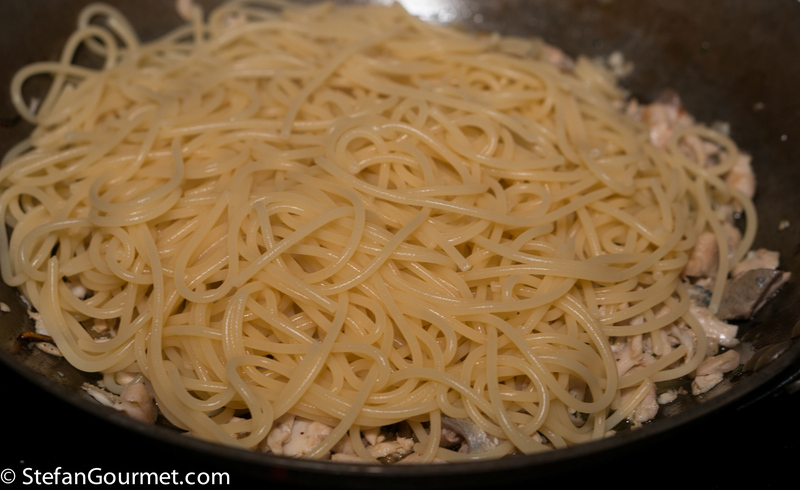 When the water for the pasta boils, add salt and the spaghetti. Cook for the time indicated on the package for al dente. 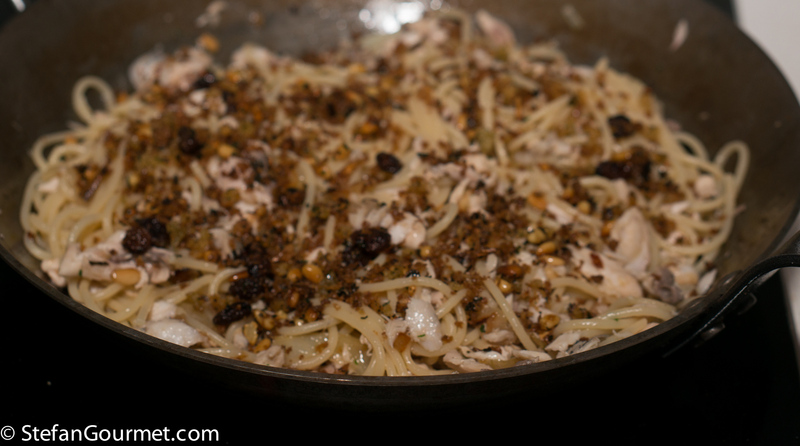 When the onions are soft and golden, add the mackerel and turn off the heat. 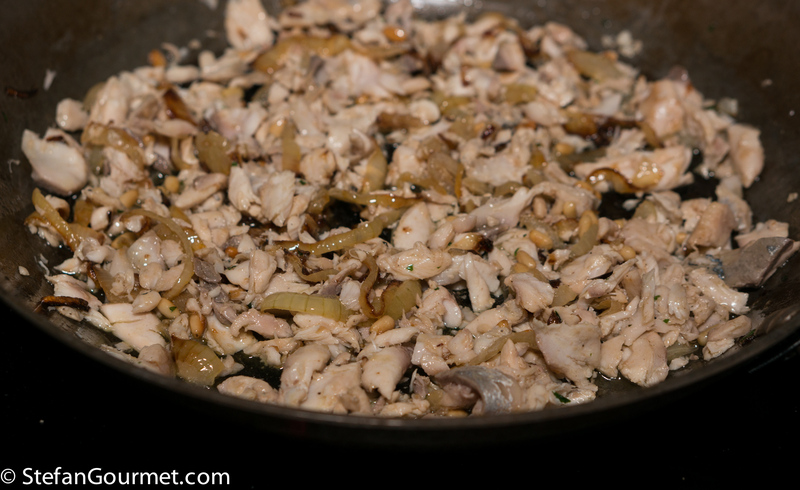 Stir such that the mackerel will cook in the residual heat of the onions, without overcooking. 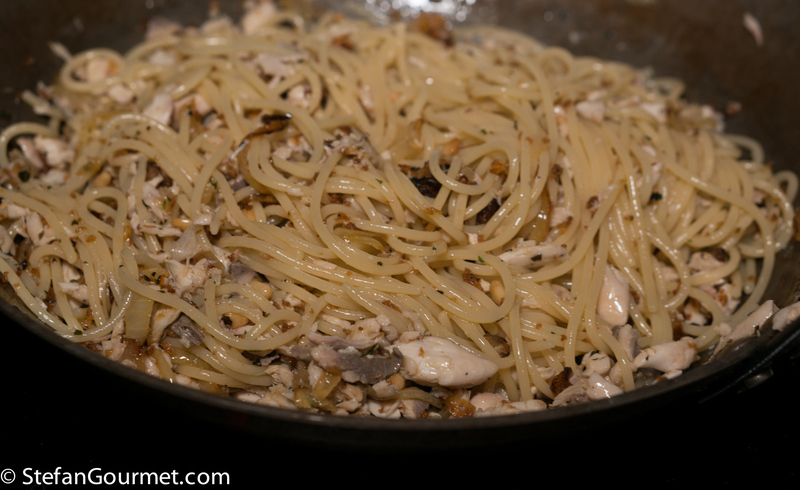 When the spaghetti is al dente, drain it, reserving some of the cooking water, and add the spaghetti to the onions and mackerel. …and toss to mix. Add some of the reserved cooking water if it gets too dry. 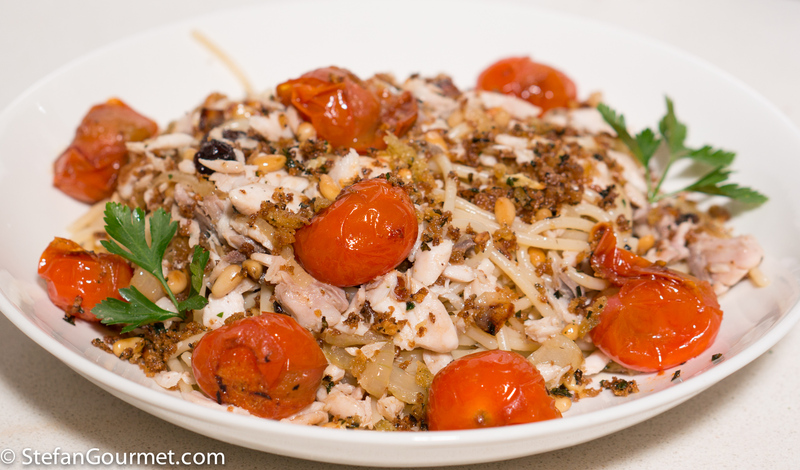 Serve on preheated plates, garnished with the tomatoes and the remaining breadcrumbs. 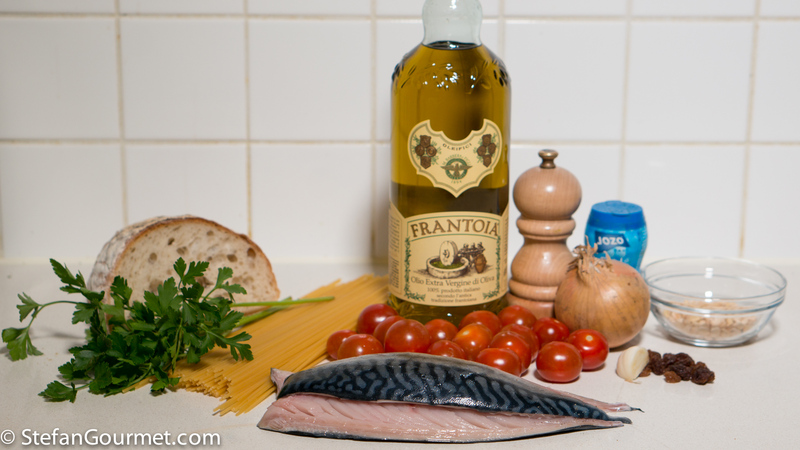 Drizzle with some very good extra virgin olive oil, if you like. This hazelnut and beet cake is very original and very tasty, because the beets combine very well with the toasted hazelnut and give the cake an earthy flavor. 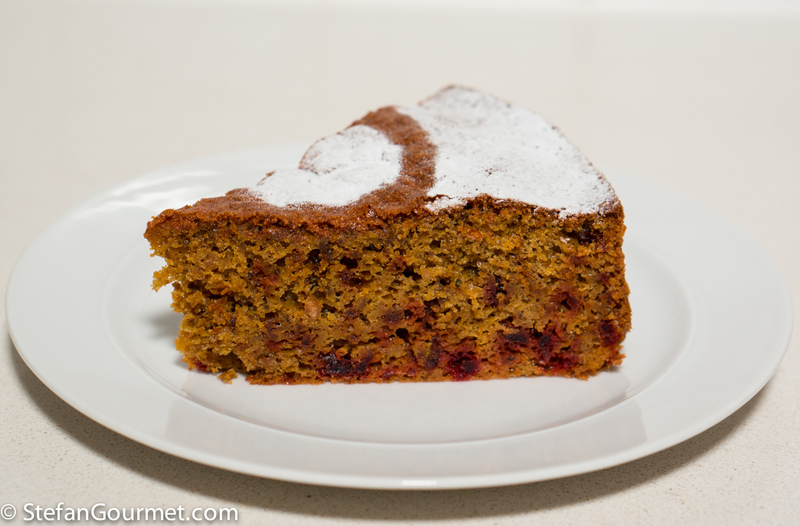 The flavors are very well balanced, the cake isn’t too sweat and it is nicely moist. Oh yes – another recipe flying right across the dining-room from my study onto the kitchen bench 🙂 ! Love you showcasing a dish in such a flavourful manner ! And you have taught me ‘language’ again this time around . . . if my Estonian heritage says ‘skumbria’ I do think I am being directed to ‘sgombro’, ie ‘mackerel’ ! Easy-peasy if you know how . . . 🙂 ! The Latin name is Scombridae. 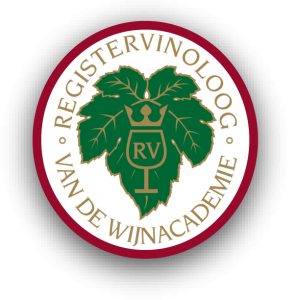 I remember coming to Australia and going to high school: my darling father was absolutely horrified that Latin was not part of the curriculum . . . . I did not the agree, but life would indeed have been easier if I had that in my back pocket . . . Sorry Stefan I wrote dish but my Samsung, as usual, changed the word. It happens to me all the time, especially because I type in Dutch, English, and Italian, and the keyboard is often set to the wrong language. Thanks for this: no problems in accessing good quality smoked mackerel here . . . simply had not thought of using it this way . . .
Questo mi piace e piacerà a tutti qui. Grazie! Da siciliana posso dire ottimo piatto sia con gli sgombri che con le alici.